Saturn just got some golden bling. 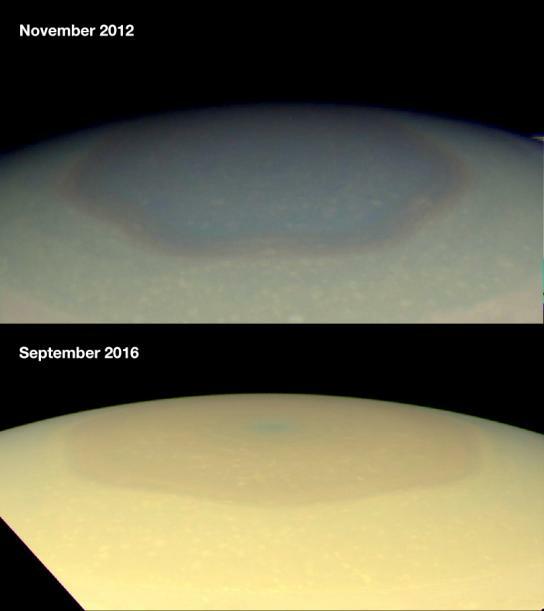 The mysterious hexagon on Saturn’s north pole has just changed colors, as shown in recently released photos taken by NASA’s Cassini spacecraft. Discovered roughly 30 years ago, the geometric figure on Saturn’s northernmost area is actually a storm, which has been raging for decades, or even centuries. The six-sided figure spans about 32,000 km (20,000 miles) in diameter, and extends for 100 km (60 miles) into the gas giant’s atmosphere. Each point in the hexagon rotates at its center at almost the same rate Saturn rotates on its axis. The perpetual hurricane in middle of the hexagon is constantly blasted by a jet stream of air at 321 km/h (200 mph). Researchers believe the hexagon’s sides act like barriers, preventing haze particles from outside to enter. This likely explains why the hexagon turned blue sometime between November 1995 and August 2009, during a polar winter night. Presumably, while it was devoid of sunlight, Saturn’s north pole became clear of aerosols produced by photochemical reactions. After Saturn’s equinox in August 2009, the planet’s polar atmospheres have been bathed in sunlight. Photochemical reactions in the atmosphere were triggered, producing aerosols that make the north pole’s hexagon hurricane hazy and appear golden in the recent Cassini photo. It shouldn’t really come as a surprise that we don’t understand much of what’s going on in our giant gas neighbor. The mysteries of space continually baffle us, until technological advances catch up and explain the previously unexplainable. At that point, we’ll no longer be amazed. We’ll be mesmerized.